EVERAL MONTHS AGO, VCL readers may recall, I posted about my work, the Simple English Choral Propers which uses the offertories from the “Simple English Propers” by Adam Bartlett (unaltered) as cantus firmi. The aim of these pieces: parish choirs of all sizes and skill levels who desire chant-based polyphony for their offertory Mass propers. They also propose a good stepping stone for the beginning choir to approach polyphony. The strong response to my earlier post introducing these pieces shows 1) the enduring quality of the SEP themselves, 2) a desire on the part of parish choirs to choose a chant-based polyphonic setting of the offertory propers, 3) parish choirs preferring to eliminate the necessity of a second offertory song after a ‘compulsory’ propers chant exposition – as I have witnessed several parish choirs do since embracing the propers chants, and 4) the attractiveness of psalm tones proclaimed in choral harmony. In the not too far off future, the entire cycle will be posted and a complete book will be available. 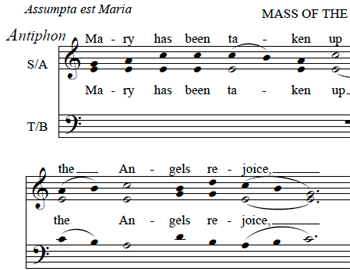 At present, I am introducing a limited selection of the pieces that they may continue to get the ball rolling for parish choirs who find the SEP attractive and wish to explore more deeply the chant’s harmonic and rhythmic implications. Assumed is a basic knowledge of the Simple English Propers as these pieces follow the same modus operandi. For those unfamiliar with SEP, they may want to look at this practical guide. A tutorial on SE Choral versions may be found here. We hope you enjoyed this guest post by Jon Naples.